Breaking in your new pipe is a crucial step in making a sweet tasting, long lasting pipe. It takes time, patience and skill. It is an investment whose rewards will be reaped manifold. The goal when breaking in a pipe is to remove any remaining impurities in the briar and to develop a uniform cake around the wall of the entire smoking chamber. The cake, like the firebrick in a fireplace, serves to insulate the briar while reducing the possibility of burning out your new pipe. As your pipe develops a carbon cake, the flavor of your tobacco will change and you will experience a cooler, drier, more mellow and richer smoke. For the first smoke in your new pipe lightly moisten the inside of the bowl with water or honey to help the carbon bond to the interior wall. Fill the bowl only with as much tobacco as you can smoke in one sitting. Make certain the full surface is lighted, then smoke to the bottom. This will start a carbon coating in the heel of the bowl as well as the sides. 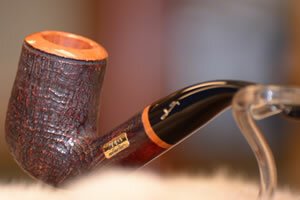 As your new pipe breaks in, it should only be smoked indoors, as wind will not permit a uniform char to develop. Smoke slowly; let the full taste of the tobacco reach your tongue. Develop a rhythm to your puff so that the bowl is never too hot to hold comfortably. Don’t be concerned if you have to relight several times; it's better than having an overly hot pipe and an irritated tongue. Your new pipe should be smoked only once or twice per day. Patience here will be repaid later with cooler and drier smokes. Some people smoke their new pipe by taking deep drags or smoking rapidly. They believe that constant puffing is necessary to prevent it from going out. Actually, the flavor of pipe tobacco is often most enhanced when the pipe is smoldering-just on the verge of going out. Also a pipe smoked slowly permits less condensation to develop and consequently smokes much drier. Actually, there is no mystery to pipe smoking. It is an art that, with a little patience and practice, is easily mastered. A few simple rules will give you a chance to enjoy one of life's great pleasures. 2. Gravity fill your bowl all the way to the top. You will then tamp this fill two thirds of the way down the bowl. Gravity fill your bowl again and tamp one third from the top. Gravity fill your pipe a third time slightly over filling the bowl. Now it is time to tamp for the third time. A properly filled bowl will have a springy feel to the touch. Just as no one would enjoy a poorly rolled cigar, a pipe smoker will derive little pleasure from a pipe that is not properly packed. 3. Light your pipe by passing the flame (matches or butane) in a circular motion over the entire surface of the tobacco. Draw on the mouthpiece with long puffs. Then smooth and tamp down the burning tobacco with a pipe tool and relight. 4. Puff slowly and evenly. It is better to relight than to discover a pipe which is burning too hot. Shallow draft "baby puffs" rather than deep draws will provide a fuller flavor and a cooler smoke. Whenever your pipe goes out, tamp the surface lightly and relight. Your pipe will stay lit much better after a cake is formed and you develop the right rhythm to keep the tobacco burning steadily. 5. After smoking your pipe, take a pipe tool and gently fluff out the ash. Run a pipe cleaner through the stem and into the bowl and set the pipe aside bowl down to cool and dry. Remember: the more time you give your pipe between smokes, the better it will smoke. Be sure to rotate your pipes. Pipe cleaners are an inexpensive way to insure against a sour pipe. Use them liberally. Be sure that your pipe has completely cooled before disengaging the stem from the bowl. Twist the stem from the bowl. 6. When you have questions, we at Mission Pipe Shop are at your service. Remember, anyone with patience and perseverance can enjoy the sublime pleasures of pipe smoking.